It is often helpful to understand what operations take how much time while running a model. This helps optimize the model to run faster. In this tutorial, we will learn how to profile MXNet models to measure their running time and memory consumption using the MXNet profiler. From the output above, it seems as if printing the output takes lot more time that multiplying two large matrices. That doesn’t feel right. This is because, in MXNet, all operations are executed asynchronously. So, when nd.dot(x, x) returns, the matrix multiplication is not complete, it has only been queued for execution. asnumpy in print(y.asnumpy()) however, waits for the result to be computed and hence takes longer time. While it is possible to use NDArray.waitall() before and after operations to get running time of operations, it is not a scalable method to measure running time of multiple sets of operations, especially in a Sequential or Hybrid network. The correct way to measure running time of MXNet models is to use MXNet profiler. In the rest of this tutorial, we will learn how to use the MXNet profiler to measure the running time and memory consumption of MXNet models. You can import the profiler and configure it from Python code. aggregate_stats aggregates statistics in memory which can then be printed to console by calling profiler.dumps(). Let’s build a small convolutional neural network that we can use for profiling. We need data that we can run through the network for profiling. We’ll use the MNIST dataset. Let’s define a method that will run one training iteration given data and label. When the first forward pass is run on a network, MXNet does a number of housekeeping tasks including inferring the shapes of various parameters, allocating memory for intermediate and final outputs, etc. For these reasons, profiling the first iteration doesn’t provide accurate results. We will, therefore skip the first iteration. We’ll run the next iteration with the profiler turned on. Between running and stopping the profiler, you can also pause and resume the profiler using profiler.pause() and profiler.resume() respectively to profile only parts of the code you want to profile. The method described above requires code changes to start and stop the profiler. You can also start the profiler automatically and profile the entire code without any code changes using the MXNET_PROFILER_AUTOSTART environment variable. MXNet will start the profiler automatically if you run your code with the environment variable MXNET_PROFILER_AUTOSTART set to 1. The profiler output is stored into profile.json in the current directory. Note that the profiler output could be large depending on your code. It might be helpful to profile only sections of your code using the set_state API described in the previous section. MXNet executes computation graphs in ‘bulk mode’ which reduces kernel launch gaps in between symbolic operators for faster execution. This could reduce the granularity of the profiler output. If you need profiling result of every operator, please set the environment variables MXNET_EXEC_BULK_EXEC_INFERENCE and MXNET_EXEC_BULK_EXEC_TRAIN to 0 to disable the bulk execution mode. There are two ways to view the information collected by the profiler. You can either view it in the console or you can view a more graphical version in a browser. You can use the profiler.dumps() method to view the information collected by the profiler in the console. The collected information contains time taken by each operator, time taken by each C API and memory consumed in both CPU and GPU. You can also dump the information collected by the profiler into a json file using the profiler.dump() function and view it in a browser. dump() creates a json file which can be viewed using a trace consumer like chrome://tracing in the Chrome browser. 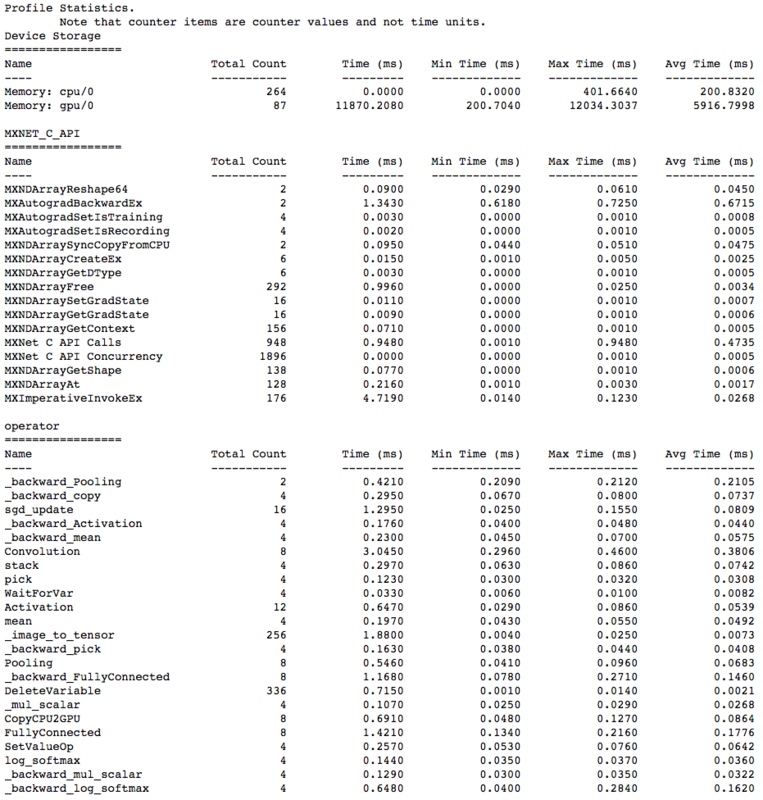 Here is a snapshot that shows the output of the profiling we did above. The above picture visualizes the sequence in which the operators were executed and the time taken by each operator. Some tips for improving MXNet performance.